Your wedding is the most important day of your life, so why not make it one to remember for the rest of your lives? Okay, so just the fact that you are getting married is enough that you will never forget the day, but this doesn't mean you can't add a little more excitement to the day with confetti cannons from the Wedding Sparkler Outlet. Aren't They Just for Parties? Well, it’s not called a party confetti cannon for nothing. Along with this, your wedding is a big party - one of the best you’ll ever throw. And what do you have at parties? You have plenty of confetti cannons for all of your guests to shoot off at the appropriate times! But why confetti cannons? You want your guests to have a good time at your wedding and reception. They are there to celebrate the love you share and your special day in which the two of you have chosen to become one. Imagine how you are going to feel when each of your guests shower you in brightly colored confetti from the party confetti cannon he or she is holding! Or, perhaps you would prefer to wait for the shower to begin until after you walk out of the church as husband and wife. Many of our confetti cannons contain biodegradable paper confetti that is perfect for outdoor use. Although you need to get the bulk of the mess cleaned up, they make clean up much easier as the little bits you miss will dissolve very quickly, out of sight. The reception truly is the time and place for everyone to celebrate your wedding and enjoy the party. It is also the perfect time to keep a healthy supply of confetti cannons on hand. Your guests can use them to shower the happy couple during that all-important first dance and then let loose on each other, carpeting the floor in a riot of color. Then there are the wedding photographs. 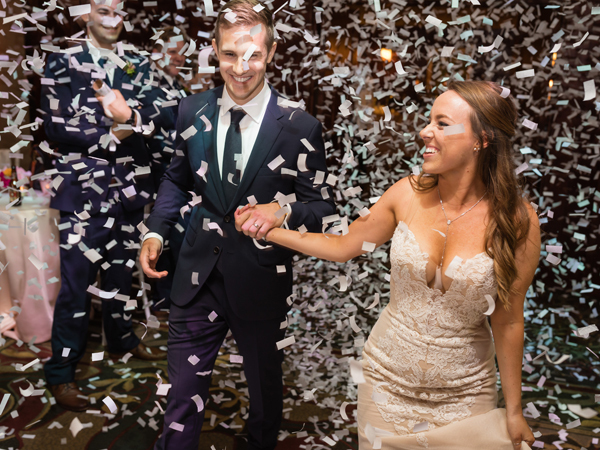 Confetti showers can be used to add a touch of magic and excitement to many of the various photographs of your special day. If you really want to mix it up and add more magic to your photographs, why not also have some of your guests use our wedding sparklers to add a golden glow? Every minute of your wedding day should be one to remember, so be ready to take those extra steps to make sure that every one of these minutes is special. What better way to do this than by ensuring your guests have ready access to a wide selection of confetti cannons from the Wedding Sparkler Outlet. Our party confetti cannons are powered by compressed air, making them safe for indoor use. Our confetti cannons come in a variety of colors including bright red hearts. They are available in 12-inch and 18-inch sizes and do not contain any type of pyrotechnic. They are safe, fun, and are sure to add that touch of excitement to your magical day!